Cleo Marjorie Thomas, 92, of Chillicothe, passed away Wednesday, August 8, 2018 at the Baptist Home in Chillicothe. Cleo was born on July 2, 1926 in Wheeling, the daughter of Arley Devila and Gladys Maude Harvey Mace. She was a graduate of Wheeling High School and became a Licensed Practical Nurse, working many years at Hedrick Medical Center. Cleo married Max Thomas on June 22, 1978 in Chillicothe. 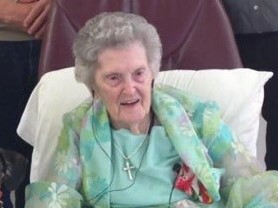 Cleo was a lifelong servant of the Lord at the Wheeling Baptist Church. She enjoyed many things in her full life such as sewing, reading and most of all her time with her kids and grandchildren. She is survived by her children, Gary Brenneman (Susie) of Meadville; Jo Anne Trump of Trenton; Rick Brenneman of Bucklin; Beth Lindahl (Rodger) of Kidder; grandchildren, Angie Hamilton (David) of Meadville; Aaron Brenneman of Platte City; Christie Scott (Dale) of Valdez, AK; Dr. Michael Trump (Melinda) of Overland Park, KS; Chris Stuver (Ellie) of Carrollton; Brent Stuver of Rosehill KS; Kelsey Ehmke (Chris) of Columbia; Charley Lock of Columbia; great grandchildren, Jacob Hamilton (Ashley) of Chillicothe; Kellie Hamilton of Meadville; Buddy Scott of Fairbanks AK; Angela Weaver (Caleb ) of Valdez, AK; Nik Stuver of Rosehill, KS; Carter Stuver of Rosehill KS; Josie Stuver of Carrollton; Lucy Belle Ehmke of Columbia; great great grandchildren, Luke Hamilton of Chillicothe; Sammy Weaver of Valdez, AK; Lunabelle Weaver of Valdez, AK. Cleo was preceded in death by her parents, Arley and Gladys Mace; husband, Max Thomas; son, Robert Brenneman; grandson, Nick Trump. A visitation will be held Sunday, August 12, at Heritage Funeral Home in Chillicothe MO. from 6:00 p.m. until 8:00 p.m.
A funeral service will take place on Monday, August 13, 2018 at 10:00 a.m. at the Wheeling Baptist Church, in Wheeling MO. Burial will take place at Wheeling Cemetery, Wheeling, MO.